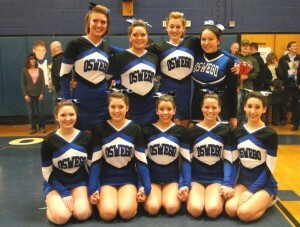 OSWEGO, NY – Some Oswego High School teams have earned post season berths while others are still attempting to qualify. Hockey and boys’ basketball are tournament bound while the Lady Bucs basketball squad needs a victory to advance. Meanwhile, wrestling had some solid performances in Class A action. The Oswego High School boys’ varsity basketball team clinched a spot in post season play with a split of two tight games this past weekend. Saturday, at Rome, the injury depleted Bucs gained a section qualifying 48-46 victory. Zach Gillard scored 16 to lead the Bucs and was followed by Josh Lazzaro with 10. Oswego moved to 8-9 on the year with just one game to go (at Central Square tonight February 11). 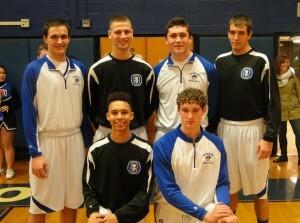 Friday night at Powers Gym it was senior night as Mylek Hoyt, Garrett Skinner, Steve Kunelius, Ryan Lavner, Ryan Kearns and Matt Giudilli played their final regular season home game against Baldwinsville. The Bees walked out with a 40-39 victory in a game that went down to the final second. Oswego held a 9-5 lead after one, but trailed 21-18 at halftime. In the third the battle continued as the Bucs and Bees were tied at 27-27. Lazzaro made numerous key plays in the final quarter, but it wasn’t enough as Oswego fell one point short. Lazzaro finished with a game high 16 while Gillard added 11, Lavner eight, Giudilli and Skinner two each. Cheerleaders were also recognized on senior night and they included Olivia Frazier, Cory Gates, Mackenzie Harpst, Shantal Harrington, Breanna Merz, Tiffany Sorbrino, Rachel Wood, Mackenzie Pittsley and Emily Yamada. Despite losing two one-goal games during the weekend the Oswego boys’ hockey team captured the divisional crown and will host a first round Section III Ice Hockey Tournament game. The Bucs lost to Whitesboro 3-2 in overtime on Saturday night at Crisafulli Rink while the night before the team lost to Cortland-Homer 3-2. It was a disappointing weekend as the Bucs faced the fourth and fifth place teams from the other division. However, the stage has been set for post season action with Oswego hosting Whitesboro on Thursday at 7 p.m. on the Crisafulli ice. Against Cortland-Homer the Bucs received goals from Sean Money and Zach Zerrahn while Jake Oleyourryk picked up an assist. In net, Donovan Roy had 24 saves. On Saturday Oswego was up 2-1 after one period, but Whitesboro scored in the third to make it 2-2. However, in overtime Whitesboro, fighting for its season, gained a berth in post season play with a red lighter and eliminated Cortland-Homer from play off competition. For the Bucs, Anthony Donabella and Oleyourryk scored while Liam Peterson and Mooney picked up assists. In net, Roy had 30 saves. Oswego finished 8-5 in division play which was identical to New Hartford, but the Bucs held the tie breaker. The Bucs finished 9-11 on the year. The Class A wrestling tournament saw two Bucs capture top honors and another finish second while there were also a third place and fourth for Oswego. Jordan Attwood, at 152, captured his class as he decisioned Kyle Kuty of New Hartford 3-0 and then scored a 4-1 verdict over Max Emond of Central Square. The other winner was Austin Piazza, at 195 as he started with an injury default of Travis Kemp of Fulton in 2:24 and then followed up with a major 14-4 decision over Kate Andrews of Carthage. Chalking up runner up honors was Austin Coleman at 132. He scored a 6-2 win over Anthony Inman of Whitesboro, followed up with a 5:01 pin of Danien Lynch of Indian River and then lost the championship match 5-3 to Jonathon Earl of Fulton. Eric Doviak earned third at 285 as he pinned Dylan Ashford in 5:25, but then lost to Joe Madonia of Whitesboro 4-2 in a sudden victory. He fought back for a 7-0 win over Ryan McCormick of New Hartford and then finished third with an 8-1 win over Malachie Manford of Fulton. Jordan Perchway, at 138, was fourth as he decisioned Ben Mayers of Central Square 5-0, lost to Sean McKenna of New Hartford in 41 seconds, but came back to pin Jacob White of Whitesboro in 2:03. He finished by falling to Tim Holden of Fulton 5-1. The post season aspirations between Oswego and Central Square will be determined on Tuesday night when the teams meet on senior night at Power Gymnasium at the Frederick Leighton Elementary School. The Lady Bucs scrambled to gain the win over the B’ville Bees, but came up short. McKenna Brooks had a spectacular game with 22 points, 14 rebounds, five steals and three blocks while Marguerite Dillon had 18 points, nine rebounds, five steals and three assists. The teams traded baskets during the first eight minutes with the Bucs leading 13-12 after one. Oswego boosted the advantage to 31-24 by halftime. Reilly Patrick finished with five points and two assists, Erica Atkins four points and two rebounds while Rachael Purtell had three points and Brenna Riley had three points and four rebounds. Working the boards was Bella Winklestine with 13 rebounds to go along with her two points. The Oswego jayvee basketball team had a tight game with Baldwinsville before losing 55-50. Oswego trailed by a point at the end of every quarter. Jake Dumas had 17, Trevor Bradshaw 11, Trey Clark six, Jake Gerber five, Carson Smith five, Isaac Annal four and Alex Haessig two. On Saturday at Rome the Bucs lost 66-53. The home team went on a 20-8 run in the second quarter to lead 30-14. Clark finished with 20 while also scoring were Gerber 11, Dumas seven, Smith six, Jake Johnson three, Bradshaw along with Haessig and Jason Jones two each.